Can you build me a banana boat? And a peel that really peels? Watch out for black tarantulas! Who’ll swim me to Ontario. And sing serenades to sunken ships. Until the next wave breaks? Dan Morey is a freelance writer in Pennsylvania. He’s worked as a book critic, nightlife columnist, travel correspondent and outdoor journalist. His writing has appeared in Hobart, Cleaver Magazine, McSweeney’s Quarterly and others. He was nominated for a Pushcart Prize in 2017. Find him at danmorey.weebly.com. 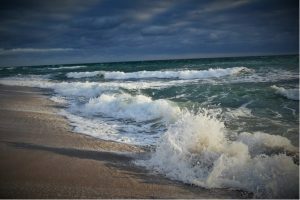 Photographer’s Note: My strongest visual of this poem waited until the last line – “Until the next wave breaks.” I can hear the poet’s beach mix, each song competing with the sound of crashing waves. While my interpretation is not deep, in my mind, I am there listening to those tunes and cleansing my soul.